Watch For Motorcycles Contest Winners Announced | Hupy and Abraham, S.C.
Our firm is dedicated to reducing motorcycle crashes that cause injury or death. Part of the problem stems from inattentive drivers of other vehicles who violate the cyclist's right of way. 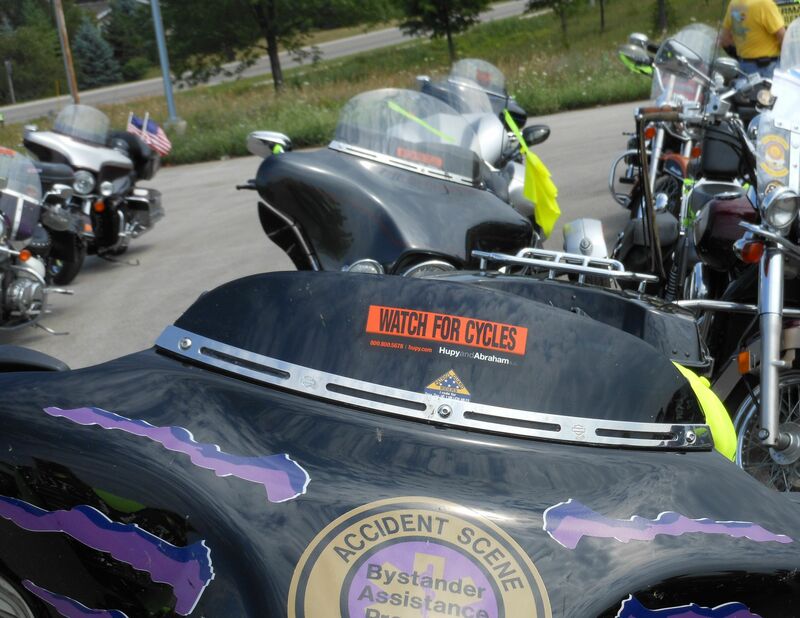 Several years ago we began giving away free stickers for vehicles with our Watch For Motorcycles message. In order to encourage people to use these stickers, we have conducted different contests over the past two years. In 2012, we asked people to become Save a Life volunteers by convincing motorists to affix our sticker to their vehicles. By filling out verification sheets and sending the names of sticker users to us, we automatically entered the volunteer in a contest to see who got the most stickers placed. This year, Mike Cushway of Breckenridge, Michigan placed the most stickers and won the grand prize of $1,500. Congratulations Mike. Although Mike is a member of ABATE of Michigan, it didn't qualify him for the matching winnings offer. If he had been a member of ABATE of Wisconsin, ABATE would have earned a matching $1,500. Another contest running simultaneously with the sticker contest was a photo contest. Participants emailed photos of vehicles with our Watch For Motorcycles stickers on them and were automatically entered into a drawing. First place was won by Lisa Marshall, Rockford, Illinois. Second place was won by Casey Guilfoyle of Sobieski, Wisconsin. Third place went to Doug Roberts, Plano, Texas. Congratulations to all these winners and thank you for helping spread the important message to Watch For Motorcycles.